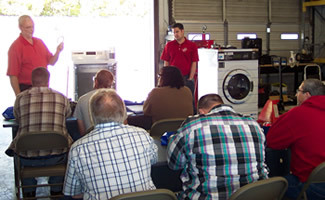 Every year Justin Laundry Systems holds service schools to teach you how to fix and maintain your own laundry equipment. These service schools are taught by actual manufacturer service representatives with very little or no cost to the participants. A good laundry facility always starts with proper knowledge. Justin Laundry Systems gives you the opportunity to become more knowledgeable about laundry maintenance in order to save you time and money. “I really enjoy coming to the Justin Laundry Systems service schools. The amount of service knowledge I have learned has allowed me to service my own machines and save me money! I’ve met people from all over the mid-South during service schools and had a great time”.